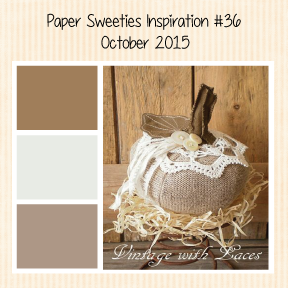 Welcome to the October 2015 Paper Sweeties Inspiration Challenge! So... 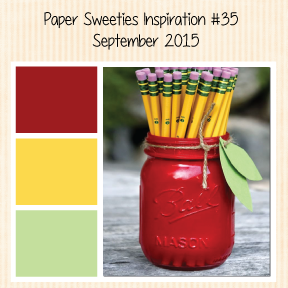 I was so excited to find out I won the August challenge over at Paper Sweeties! I got a $20 gift certificate for their store and to my surprise I was also asked to be Guest Designer for October. This is my project for my Reign as Guest Designer (lol... yes... that was meant to be funny... I always wear a crown anyway). I think in my head I combined the September challenge (the jar) and the October challenge (the color scheme). There was something about that pretty neutral-ish color scheme that made me feel warm and autumny... and lacey and jarrry. I would have loved to use the new Paper Sweeties jar stamp, but I didn't have it yet (just ordered it this morning) so I turned to my Artistry cartridge and cut it from there. Then I used some texture paste and a lace stencil to make it into a lace covered jar. One of the items I purchased with my winnings was the "Birthday Banners" set along with the dies, Birthday Banners Sweet Cuts. These dies are such good quality... they cut so easily. 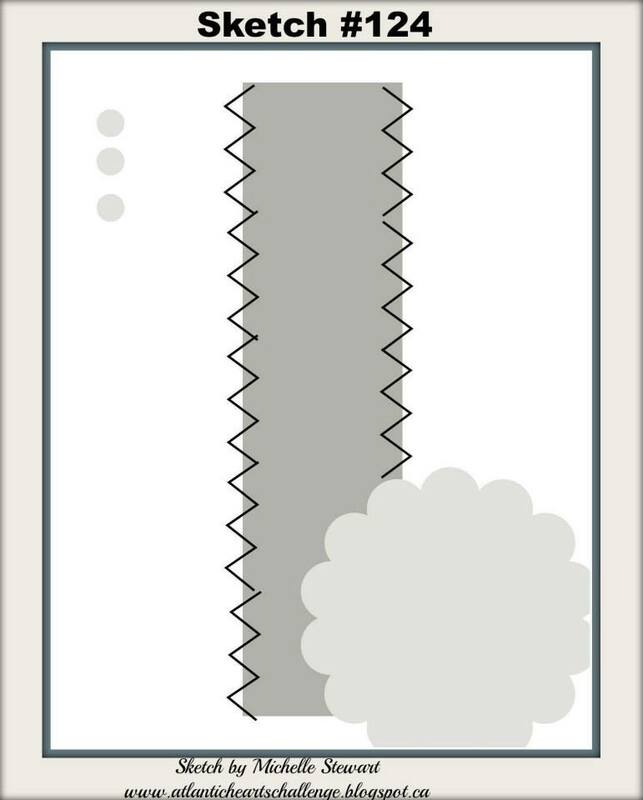 I chose this one because I liked that you could easily cut out a banner that could be colored in anyway you wanted. Of course I also used the Paper Sweeties gold sequins to hold up the banner and scattered a few on the card when I was done. These sequins are awesome because they are shaped like little flowers and I am using them heavily on my projects. It's rare I create something these days without adding at least a couple. The beautiful dyed seam binding ribbon is also from Papersweeties and this is the Tea color... love it because it's very neutral and can be used with a lot of color schemes. I also love the way the ribbon comes all crinkly and ready to add so much character. The sentiment is from Paper Sweeties "Sweetie Pie" which has some really cute and "sweet" sentiments and also a new outfit for Emma. The yellow flowers were stamped using Paper Sweeties "Party Time" stamp set. Then I cut them out, sprayed with water, waited for them to dry to damp and then scrunched them up. Once they were dry I distressed them. The leaves and white flowers were cut from Artistry and Art Philosophy respectively and basically prepared them the same way-I did spray them with gold color shine after and distressed. The Sweet sentiment was made using the Paper Sweeties Sweet Cuts dies that go along with the "Happy" stamp set. These dies would be great to get with or without the stamp set-although I got both because they are cute with the sentiments that go along with them. And of course the shaker is filled with more Paper Sweeties sequins, some glitter, and the little pearl buttony things are from The Funkie Junkie Boutique. Thanks for stopping by and don't forget to head over to the Paper Sweeties blog and check out all of the great artwork and while you're there, play along! Don't forget to come back on the 3rd for the Three Amigos Mini Blog Hop!! 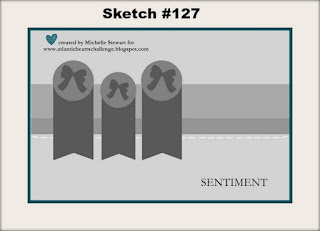 Welcome to Sketch #127 over the Atlantic Hearts Sketch Challenge! This card was a lot of fun to make. I cut the gears from Artiste and the Happy Sentiment from Artistry. The paper is Nevermore... I'm telling you... it's not just for Halloween!! So the most fun was making these gears look rusty. I got some new Rusty Paper paint from the Funkie Junkie Boutique. I cut the gears from gray and orange paper and then dry brushed the paint on it and then when that was dry sponge distressed with black. I LOOOOVE! And other than that, thanks to Michelle's fantastic Sketch... this one was a breeze! Thanks for stopping by and don't forget to head over to Atlantic Hearts and see all of the great projects from everyone. So, I stumbled upon a new (to me) challenge while on the Paper Sweeties website. 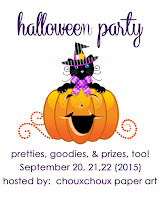 It's on the Coffee Loving Cardmakers Blog and it's their Fall 2015 Coffee Lovers Bloghop. Lots of prizes and lots of great creations to check out. The theme is fall and coffee... from there you can let your imagination run wild. I do love coffee, and fall, and cardmaking so... I mean.. of course I had to give it a try! What's to lose? You should too. I used Close to My Heart's Urban paper pack and the Artistry cartridge for the mug (I added the "I Heart Fall" in Design Space). I used some of Paper Sweeties most awesome sequins to decorate the steam coming out of the mug and also in my little sugar packet. The leaves were cut from Artistry also, and the white flowers are from Art Philosophy. The pretty orange flowers are stamped from a Paper Sweeties set as well as the little flowers on the sugar packet and the Have a Sweet Day sentiment and of course some more awesome gold sequins. The ribbon is dyed seam binding ribbon also from Paper Sweeties. 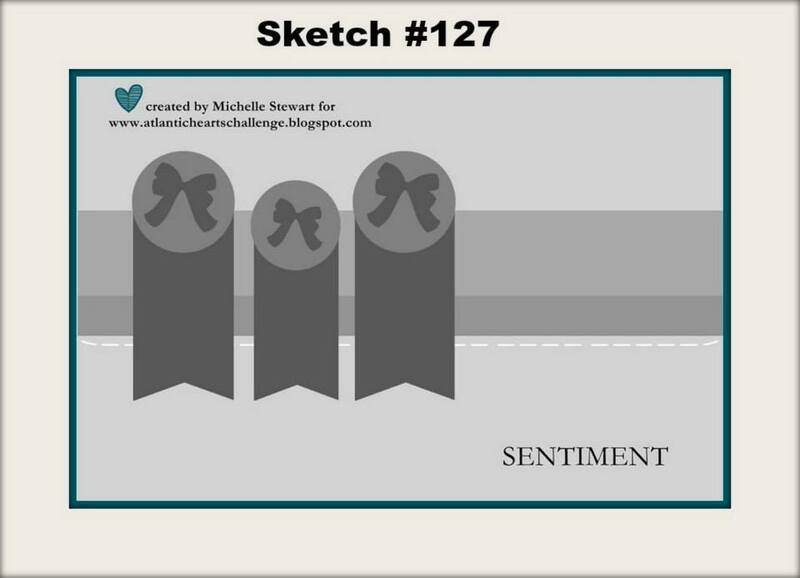 Welcome to another great sketch by Michelle over at Atlantic Hearts Sketch Challenge Blog! It's taken me a while, but I finally got a chance to break into my CTMH Nevermore paper packet. LOVE it! It really is a very versatile pack that is not limited to just Halloween, although I did choose to go in the Halloween direction with this card and I'm also entering into the ChouxChoux Paper Art Challenge #1. I have to say thank you to Jody Gustafson for the inspiration for the pumpkin. For her project for last week's Atlantic Hearts challenge she used the Artistry pumpkin and then inserted her own shapes to make the Jack-O-Lantern face she wanted so I did the same and loved her shapes, but didn't want to completely copy it so I found some different ones. I just love her project and if you click on her name above you can take a look at it or check it out on the AHSC Blog. I made some more flowers from cardstock using the same technique as I did for the pink flowers I used on some previous projects and can tell you I'm in the middle of cutting some more in varying colors for a canvas project I'm working on. I love them... they are simple, but pretty and I love the distressed look of them. The sassy cat in a hat is a free digital image that I downloaded through ChouxChoux Paper Art, the sentiment is from one of the Artistry stamp sets, gold sequins from CTMH, orange sequins from Paper Sweeties, and shimmer trim and Scaredy Cat assortment for some added shtuff! Be sure to go to both of these challenges and check out the fantastic artwork created by participants and design teams and play along while you're there! Thanks for stopping by and don't forget to let me know you were here! Created this today with CTMH's new Nevermore "Halloween" paper. The patterns on some of these papers are so versatile that they aren't just for Halloween. I've created a feminine card here along with a watercolored doily. I splattered some paint on the card after I adhered the doily. 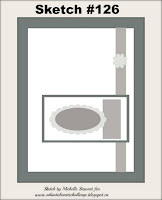 I'm entering this card into the Heart2Heart Splat Challenge. There are some really very cool projects to go take a look at and inspire you. I love the distressed and messy look so this was an easy one for me. I added some more cardstock flowers I made in different colors, some sequins and bling, I embossed the circle using the hearts using Charming Cascades and then embossed the Happy from one of the National Stamping Month sets on top of that. The butterfly is a Just Blooms butterfly that I watercolored some time ago and when I was done it wasn't right for that project but I think it's just right for this one. Thanks for stopping by and don't forget to stop back tomorrow for the Atlantic Hearts Challenge! Just a few more cards made from that 12x12 of Washi Tape covered paper. 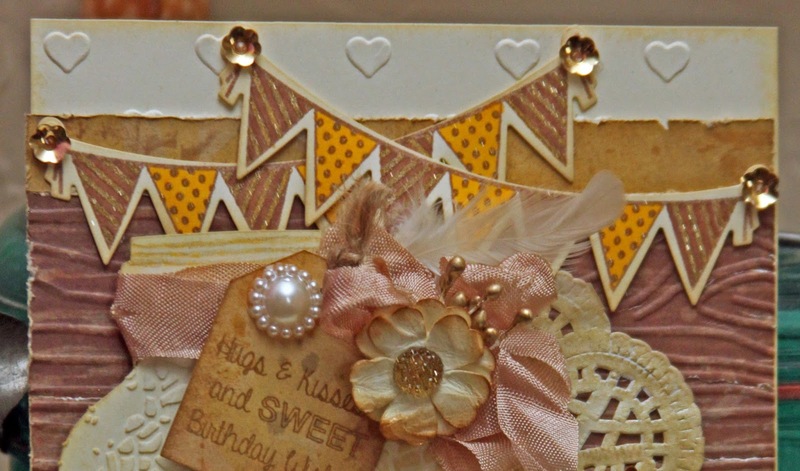 With Artfully sent, it's easy to make a set of cards with great cutout sentiments and a few embellishments! On these I used a few more of the pink cardstock flowers I made. The butterflies are Just Blooms butterflies painted. Welcome to this week's Atlantic Hearts Sketch Challenge! 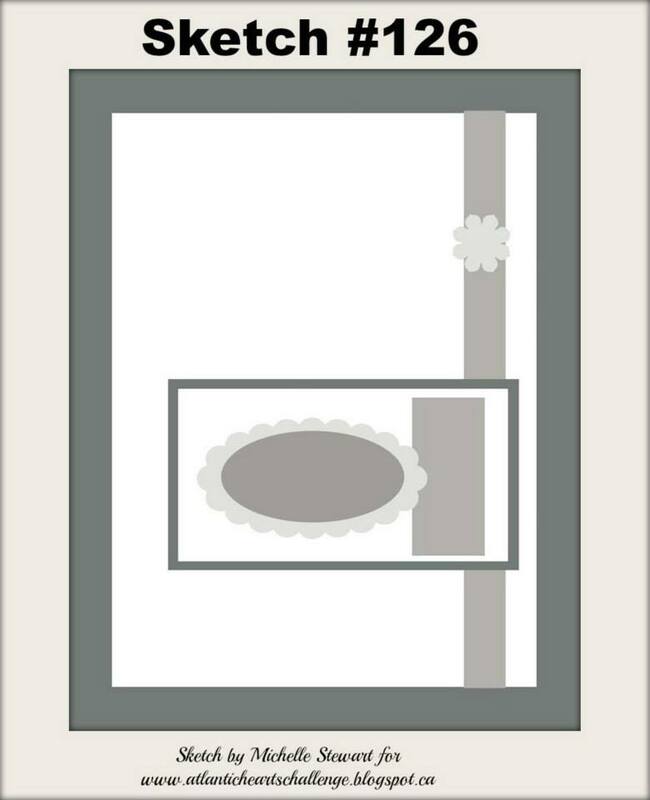 For this week's sketch I decided to make a shadow box. Pretty much it's a card or scrapbook page in a box...lol. I'll focus on the flowers for now. I used the new CTMH watercolor set and swipe the colors I wanted onto watercolor paper in kind of a random pattern. I blended a little more after I finished with just a little bit more water on my brush. Then I sprayed a little more water on and sprinkled some salt on the mixture to create those pits I love so much. After it was dry, I brushed off the salt and I used a bit of a gold metallic Gelato in a few random places and smushed it around with my finger. Then I cut a bunch of flowers on my Cricut from the Art Philosophy cartridge in varying sizes. I layed them out on a piece of paper and sprayed some more water on them. When they were still a little damp I crumpled them up, then uncrumpled them, then sprayed them with water again and waited for them to dry a little 'til they were damp and crumpled them up again and then uncrumpled them and let them dry completely. Then to add a little of the barn red that is in the papers, I distressed the edges with a sponge. That's it :)... easy peasy. It really was because for each step I'd do it and then go and work on something else. And I was in the end very happy with the way they turned out and will definitely make more of these. The paper is the retired Jackson; the sentiment and butterfly are from Artistry; the wood buttons in the center of the flower... idk... from my stash...and the oh so pretty blue sparkly flower centers are CTMH's new enamel and glitter duos. I have a basketful of cuts and scraps that are leftover .. rejects from prior projects. And a lot of old retired items from CTMH... Made a couple fairly quick cards today using Artfully Sent, Washi Tape, Glitter Paper and a few of those items plus the new Hostess Rewards Set #makesmehappy. I basically took a white sheet of cardstock and covered it in washi tape. Then I cut out 6 cards from Artfully Sent... yes, this is only two, but they were similar because I had 4 flowers leftover from my birdcage project... now they're gone... so the other cards will be different and I'll post them when they are finished. Thanks for stopping and have a great rest of your weekend... come back tomorrow because hopefully I'll have more for you! So, yeah, I got a little carried away in August and submitted a couple... three... all right... four cards for the Paper Sweeties August Challenge. And, Yay!, my cupcake card won! I got a $20 gift certificate AND I also won a really cute card kit as part of the random draw! So of course, I went shopping. This is my submission for the September challenge. I went with the color scheme as my inspiration. This card was fun to make. I started with the background which is some old, retired, Barn Red cardstock from CTMH and used a brick stencil and some texture paste. After it was dry I used Gelatos to color the brick... first some brown, then some dark red and then some lighter red. (I just got these a few weeks ago and really don't know what I'm doing... I winged it... wung it.. lol... idk). Of COURSE, I used little Emma and when I went shopping over at Paper Sweeties, I got her some new outfits. I mean she had to wear the same dress to all of her birthday parties in August... so sad. I still can't bear to put shoes on her though... the overalls are from the "I Pick You Set" as well as the basket and the flowers in her hair. I also purchased one of the newer sets, Birthday Banners as well as the dies to go with it and the word "Sweet" was cut using a Paper Sweeties die and I cut three and layered them to give it a more dimensional feel. The saying is from another really cute set that happens to have another two more outfits on it. Yeah... I spent more than my $20 gift certificate... no one here is surprised. The cute little cat in the basket is from CTMH's Operation Smile set, Animal Greetings which is adorable and will get a lot of use here. I cut the sunflowers using the Walk In My Garden and Art Nouveau cartridges. The frame and grass are from Artiste. 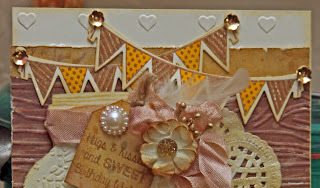 Thanks for stopping by and don't forget to check out the Paper Sweeties blog (and there is a facebook group now too!) and see all the artwork and while you're there, play along. 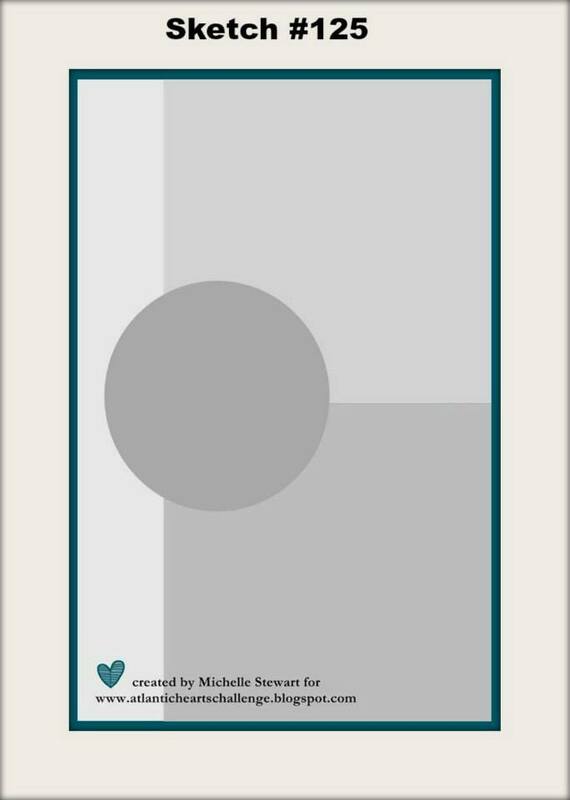 Happy Monday and it's time for Atlantic Hearts Sketch #124! So, we've all been seeing a lot of cards made with the Crazy Birds stamps from Tim Holtz I'm sure... and I just think they are so cute so I had to get them. They are not clear... they are unmounted rubber stamps but easy enough to work with since they aren't layered. Just wouldn't be good if you were picky about where you positioned it. I got the little dies along with them so it's easy to stamp them and then position the die on the paper and run it through my Cuttlebug to cut it out. I'm happy. Was excited to do some stitching on this one. I don't do it often, but I love the look of it. I got some gold thread a couple weeks ago and it doesn't show up really good against the shimmer trim, but I think I'm going to love using it a lot. I added the shimmer trim because when I punched my holes in the paper, I didn't realize my ruler was moving and it was crooked... so I covered up the holes with the shimmer trim and was more careful the next time around when punching the holes for my stitching. I think it was a happy mistake because the new green CTMH shimmer trim I think has some gold flecks in it... really beautiful.. I cut the arrow circle from Artistry, the little hearts are leftover cutouts from the PML card I used on a card previously and the center strip of watercolored paper is leftover also. The 1of a Kind sentiment was from Artiste, I cut out the crown freehand and added some Petaloo feathers because I wanted to make her a fancy Crazy Bird... or should I call her an "Eccentric Bird"? I used the new confetti embossing folder available September 1st (sneak peek!) as well as the pink gems. I have so much fun making girly cards because let's face it... with two boys, the scrapbook pages just don't satisfy my girly crafting needs. 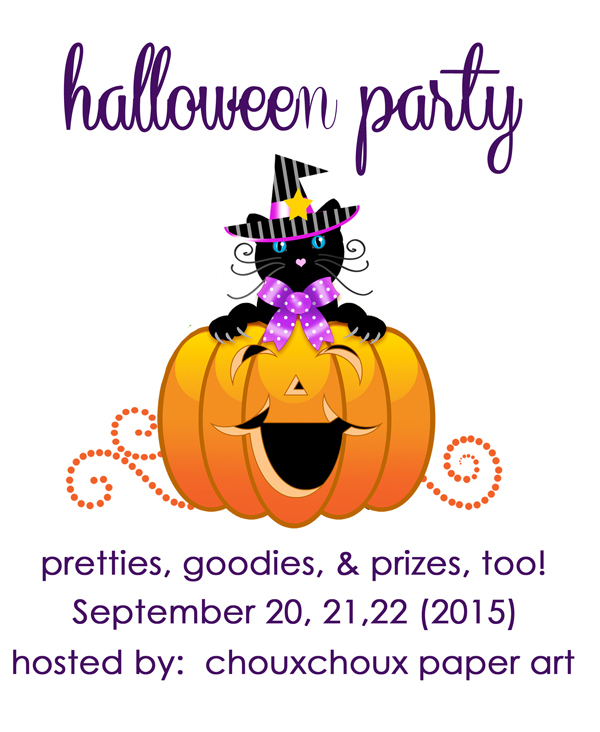 Three Amigos Blog Hop, September! So, believe it or not, it's the beginning of September! Where has the time gone? Welcome back to the Three Amigos Blog Hop. We are three good friends and CTMH consultants and we challenge each other once a month to create something with our favorite Close to My Heart Products. This month our "challenge" was to use new products from the new Idea Books that went live yesterday. I thought it would be easy and I thought I would use ALL new products... nothing old... but alas, I did end up going back to some of my old favorites and I think I got a nice blend of old and new. After all, I don't think any of us have used up all of anything yet ... lol! So, I used the fantastic "old" Artfully Sent cartridge to cut out this birdcage card. I used the new Artistry cartridge to cut the flowers (using one of our great new colors, Poppy). The leaves and vines were leftovers from previous projects and to be honest.. I have no idea what cartridges they are from any more. I used blue for the background of the card because I wanted to give the feel of blue skies and an empty cage. (Although the escapee did leave behind a couple feathers!) I embossed the blue with the new Confetti Dots Embossing Folder. The butterflies are old Just Blooms butterflies that I splashed some new watercolor paint on and added just the colors I wanted. This was a challenge.. to decide what color with everything else I had going on, so I have lots of practice butterflies that are just as pretty that I'll use later because the colors just weren't right... or the size... in the end, maybe I was just tired because I was finishing up at the last minute and I chose the purplish ones. This made me fall back on my purple glitter gems to spread that color around on the card a little bit more. The gold gems are not new, but they are in the new book. I created the sentiment from some of the Zoe complements. A large quantity of liquid glass and finally I was finished. I chose the birdcage because I had seen a card posted on one of the groups I am in that had a lot of gold and what I thought was a green patina, but it turns out it was just a reflection. It was so pretty I started thinking about giving my gold some patina. I didn't get exactly the look I wanted-I suppose it looks a little weathered, but I think with a little more work and the right products I'll get the look I want. For this one, I started with lagoon paper to cut out the cage, then embossed the entire thing in gold, but tried to leave areas where the lagoon showed through. Then I had some aqua embossing powder, but really it was too light so then I rubbed some lagoon ink over it and over the areas where the paper showed through. IDK... like I said... not exactly what I envisioned but maybe a little time on Pinterest and I'll try again.